India 3 February 2017: Vista Car Care™, an automotive detailing brand from the house of Resil Chemicals Pvt. Ltd, aims at beautifying your car. The bird-dropping or dirt settled on your car’s windshield is an eyesore. Vista introduces a hassle-free and convenient solution for your dirty windshield. Vista Kleenview is a concentrated windshield cleaner with effective cleaning properties which are safe on laminated and toughened wind screens. Kleenview is added to the automated windshield water cleaner reservoir within an individual’s car. On every application, Kleenview ensures that the car windshield gets free of dirt and grime. It effectively cleans road grime, tree sap and insect spatter. Vista Kleenview is completely safe on laminated and toughened wind screens. It is also haze, halo and streak free. Driving your car with dirty, hazy windows not only strains your eye-sight but is a driving impairment. In addition to being a hazard, the effects of dirty glass can quickly ruin the appearance of your perfectly polished and waxed automobile. The principles to a clean windshield are simple, glass cleaner, wash, dry and polish. Large bases of glass cleaners are ammonia-based. While ammonia is a great glass cleaner for the home, ammonia is harmful to many car surfaces including vinyl, rubber, and leather. More importantly, the use of ammonia to your car is harmful to your health. 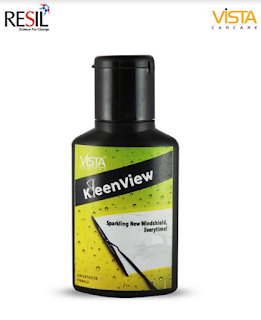 Vista Kleenview is biodegradable safe on the skin and is ammonia-free. Availability: At all Auto accessory retail outlets.